A seal rescued from a beach in Guernsey is to be transferred to a UK sanctuary for specialist care. The grey Atlantic seal pup was found suffering from malnutrition at Jaoneuse Bay and taken to the Guernsey Shelter. The one-month-old pup is due to be moved to the National Seal Sanctuary in Cornwall next week, which is better equipped to deal with young seals. A Guernsey Society for the Prevention of Cruelty to Animals spokeswoman said the pup was doing "terrific". The shelter believes it had been chased by dogs on the beach. There was no trace of the mother when it was found. It could be released within two months, once the pup has regained a full layer of blubber. 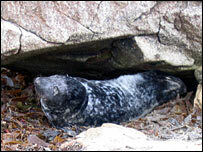 The island has a resident population of about 11 grey Atlantic seals.